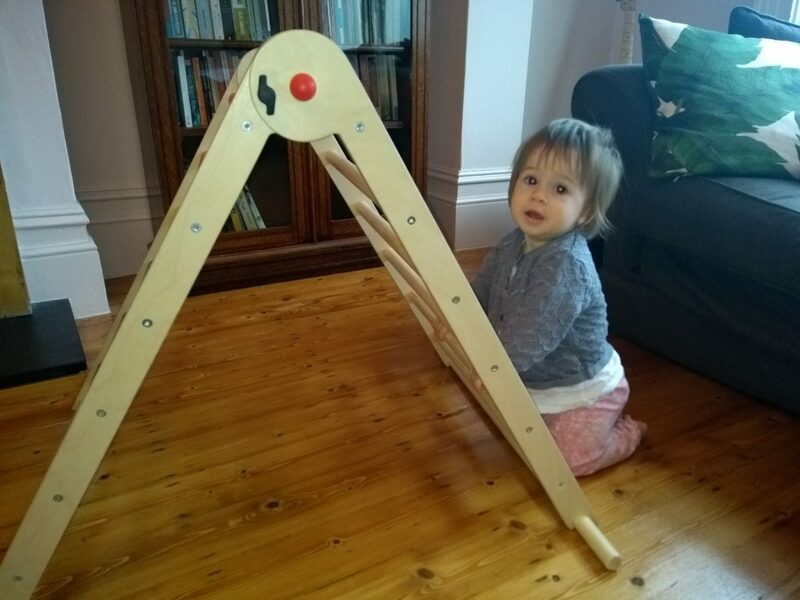 We bought Miranda a Triclimb Pikler triangle for her 1st birthday a couple of months ago. I’ve been eyeing up Pikler triangles for the past couple of years, ever since hearing about the RIE parenting philosophy. Emmi Pikler was a Hungarian pediatrician who developed a new theory of child development in the 1930s/40s, based on allowing the child to move freely and develop at his or her own pace. The RIE parenting philosophy sprung from this – I’m by no means an expert so you can read more about it here, and in Janet Lansbury’s book, “No Bad Kids: Toddler Discipline Without Shame”. 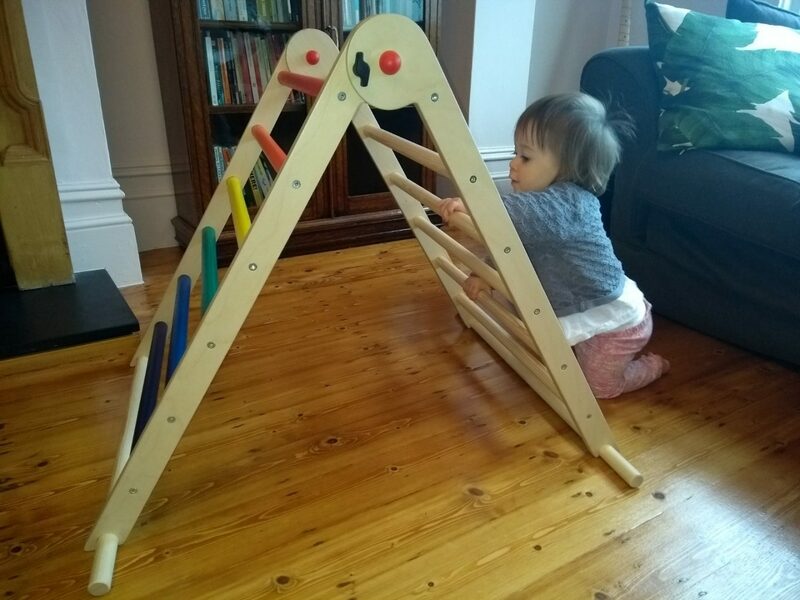 The Pikler’s triangle’s main function is to help children learn to climb and encourage movement, but it’s also a brilliant open ended toy which lends itself well to imaginative play. Various companies make them, but from my research it looked like the Welsh start-up Triclimb has the best quality version. 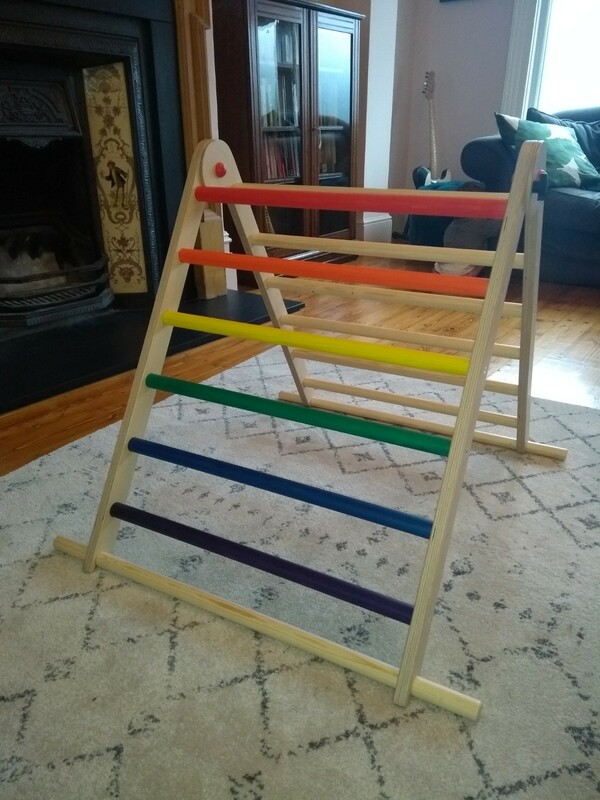 We bought ours from Babipur’s site, which also stocks lots of other lovely fair trade toys and clothes. It’s quite pricey at £210, but buying it from Babipur works out slightly cheaper than buying direct from Triclimb as they also add postage. It took a bit of persuading to convince Ed we should buy one, rather than him attempting to knock one together out of a few bits of wood from a timber yard (!) but after reading the reviews he could see it’s a quality product and thankfully we were spared from his DIY efforts. Miranda has been pulling herself to standing on it and Nathan loves climbing on it, sitting on it and throwing over a blanket to make it into a den, or lion’s cave as it was last weekend. I think the kids will get years of play from this so it’s hopefully a worthwhile investment. It also looks pretty stylish and Scandi-ish – it’s beautifully handmade and finished. The wood is from sustainable managed forests and the stain and lacquers are also non-toxic, environmentally friendly and water based. TriClimb are planning to bring out a range of accessories for their Pikler triangle soon, so I’ll keep an eye out for those and let you know when they become available. Are there any toys you’ve bought which have been a great investment? Please comment and tell us about them below! If you like this post, you may also enjoy reading this article.